“And we know that God causes all things to work together for good to those who love God, to those who are are called according to His purpose” (Romans 8:28, NASB). In the first part of this meditation we established that God is Love but human beings are willful and rebellious. We are broken and God wants to fix us. So, our redemption IS God’s master plan. Redemption is the whole purpose behind the created order. I’ve spent much of my career studying about teaching and learning and here’s one thing I have learned about how people learn. People learn best when they learn from their mistakes. They learn the right way better when they have observed or experienced the wrong way. But you don’t have to have a Ph.D. in instructional psychology to know that! Any parent knows the best way to teach your children is to let them try and fail. Failure is the best teacher of success. Sure, you can tell them how to do it and hope that they would learn from your good example, but until they actually do it themselves and fail, they never really learn it. Human beings need to learn what is right; they need to learn the truth about their existence. And learning by non-example seems to be God’s cosmic plan. If there wasn’t the opportunity to do wrong, we wouldn’t know what is right. And that’s the way it has been since the Garden of Eden! So, when I am broken, I am more capable of understanding and receiving restoration! And that’s how and why God causes all things to work together for our good. God can best reveal His love and mercy to me when I am broken and He repairs me! Yes, bad things happen to us because we are broken and God wants to repair us. That’s what He does. That’s Who He Is! That’s the plan! 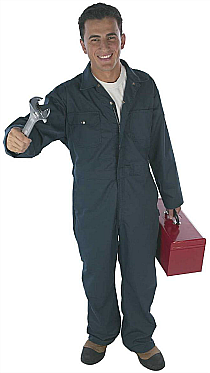 Now, God has sent a Repairman out to fix us. His name is Jesus Christ. He came into this broken world to perform some much needed repairs on us and to restore our rebellious natures to obedience to God. Jesus makes service calls! He can repair whatever is wrong with you. And when He’s done fixing you, you’re as good as new. In fact, you are new; you are a new creation! What’s more, there’s no charge. His services are free! So, why don’t you let Jesus make a service call on your broken life today? This entry was posted in God's will, good and evil, redemption and tagged Bible, God's will, good and evil, redemption. Bookmark the permalink.